Even a close game needs a winner. 13 day Sweden and Germany meets at the final of the World Games playing a tough and close game. This time they meet again at the European Championship Final at Malmö. And it was a close and hard fought game. Germany starts fast in the game. Two Interception made by the German Safety Sebastian Tuch leads to good position and stopped the Swedish Offense. On the other hand the Offense moves forwards. With a mixture Germany comes into Fieldgoal ranch. But the Kick misses the goal. On the next drive Quarterback Joachim Ullrich passes 25 Yards for the German 7:0 lead. Another Fieldgoal chance was gone in the second Quarter without any points. Nearly before Halftime Sweden uses the good field position and scored with 41 Yard Pass from Perlström to Eriksson to tie the game. This was the first time Touchdown scored against Germany for the last 5 games since 2003. “Our gameplan was to stay in contact with Germany. We want a low scoring game and use our chance in the fourth quarter” the Swedish Headcoach Christian Thore said. The plan succeeded in the second half. The Swedish team convinced in Special teams and Defense. “It was fight of field position. We move slowly forward the German endzone and in the end we are able to kick the winning field goal”. The Field goal was a 25 Yard Kick by Alnervik, leaving 8:34 at the clock. Then the Swedish Defense took control of the game. First they forced Germany to punt and on the next drive R. Biro intercepted an Pass of Ullrich. Sweden tried to run down the clock while the German defense wants to strip the ball. Running Back K Taalbi not only hold the ball, but break free and runs 80 yards to last Touchdown and the 16:7 final standing. Sweden is the new European Champion 2005. 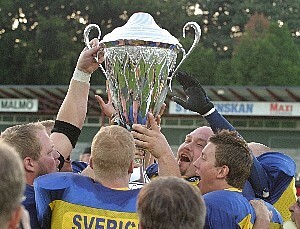 For the Swedish team it was not only the first Championship, but also the first Championship Game. So the Swedish celebrates long after the win together with the fanatic Swedish fans.